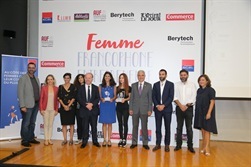 Under the patronage of Prime Minister Saad Hariri, and in the presence of Minister of State for Women's Affairs Jean Oghassabian, and Philippe Dubois, Deputy CEO of SGBL, AUF, Berytech, L’Orient-Le Jour, Le Commerce du Levant and SGBL held yesterday the final of the contest "Femme Francophone Entrepreneure" in its 7th edition, at the Campus of Innovation and Sport of Saint Joseph University - Beirut (USJ). This initiative, which promotes the role of Lebanese women in entrepreneurship, highlighted the projects of 5 enthusiastic women selected by a first jury, regrouping representatives of the contest’s partners, in which SGBL was part. The 5 finalists pitched their projects during the final, in front of the public and a jury of experts. Following these presentations, the two winners, Maya Bacha, founder of Sidelick, an innovative pet-care service, and Marielle Khayat, founder of Koullouna, a company that ships a monthly box connecting Lebanon lovers and expats to the country from afar, shared a prize of € 20,000. They will both benefit as well from the necessary support and incubation granted by Berytech. From her part, Joanna Baloglou, head of corporate communication at SGBL, said: "This project falls under our social responsibility strategy. We are constantly supporting the creation of start-ups and the development of women entrepreneurship in Lebanon. As a citizen and committed bank, SGBL supports many social responsibility initiatives on a daily basis, not forgetting our role as faithful partner of the country's francophone activities. "